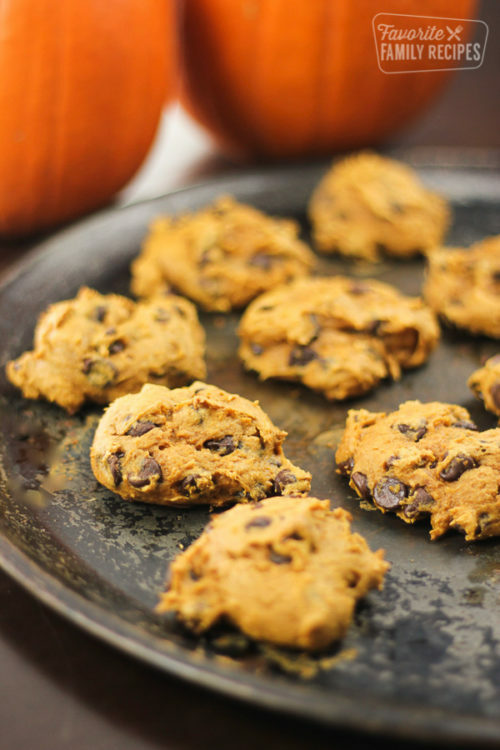 With just three simple ingredients, Pumpkin Chocolate Chip Cookies are quick and easy to make. Fluffy, chocolatey and full of delicious (and healthy!) pumpkin. 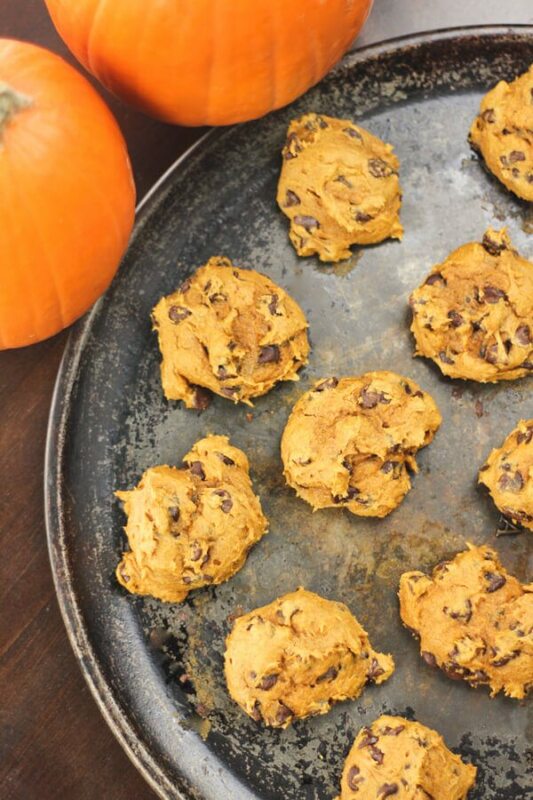 How Are These Pumpkin Chocolate Chip Cookies Only Three Ingredients? That’s it! The spice cake mix gives the cookies such a rich flavor and complements the dark chocolate. With the creamy texture of the pumpkin you’ll never even miss the oil or eggs. Try this fabulous pumpkin/chocolate combo in our Pumpkin Chocolate Chip Bundt Cake or our moist Pumpkin Chocolate Chip Bread or this sinfully rich and simple Chocolate Pumpkin Coffee Cake. 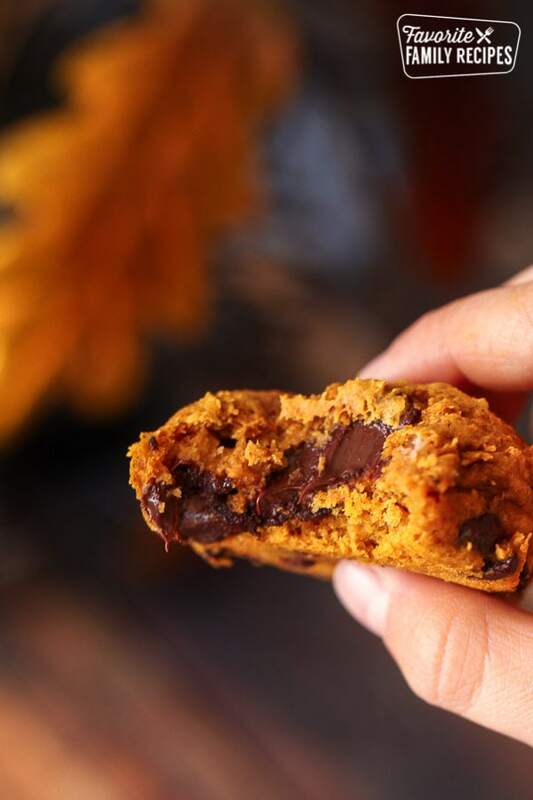 Are These Pumpkin Chocolate Chip Cookies Healthy? Because you’re omitting sugar, eggs, and oil, this is one easy cookie recipe you can feel pretty good about eating. Larger cookies (you can get about two dozen in this recipe) are approximately 95 calories a cookie! Smaller cookies, using a small cookie scoop or spoon are only about 60 calories each. Plus, pumpkin is good for you! It’s chock full of vitamins and fiber. So you don’t have to feel guilty about enjoy a cookie or two…or three. Drop cookie dough is generally a bit thinner and stickier than other cookie dough. 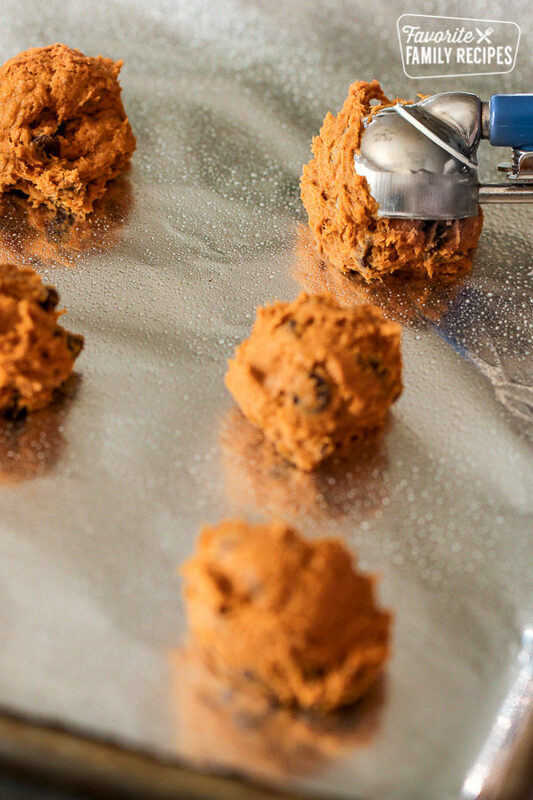 Use a cookie scoop or tablespoon to place the dough on the cookie sheet. When baking these cookies, be sure they are cooked through. Oven temps vary and if you pull them out too soon, the cookies can still be doughy in the middle. A good rule of thumb is watch to see when they’re barely starting to show a little browning on top. 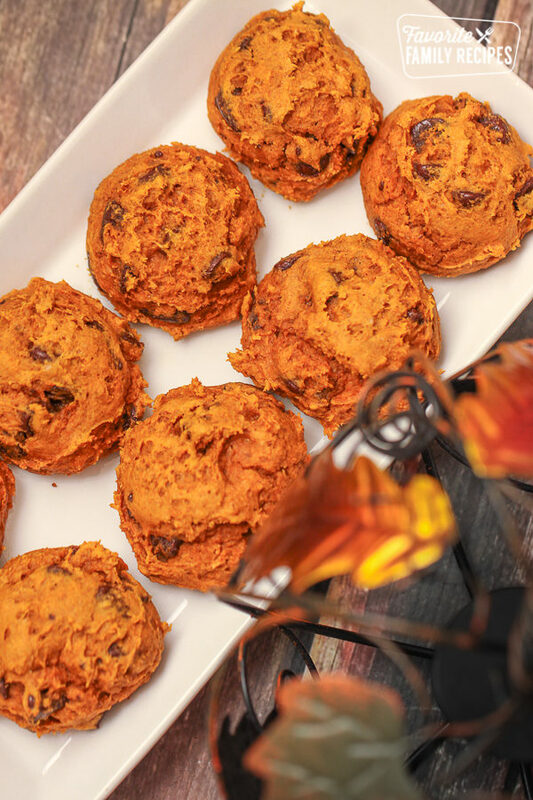 With only 3 ingredients, these Pumpkin Drop Cookies are quick and easy to make. They are moist and full of delicious (and healthy!) pumpkin. 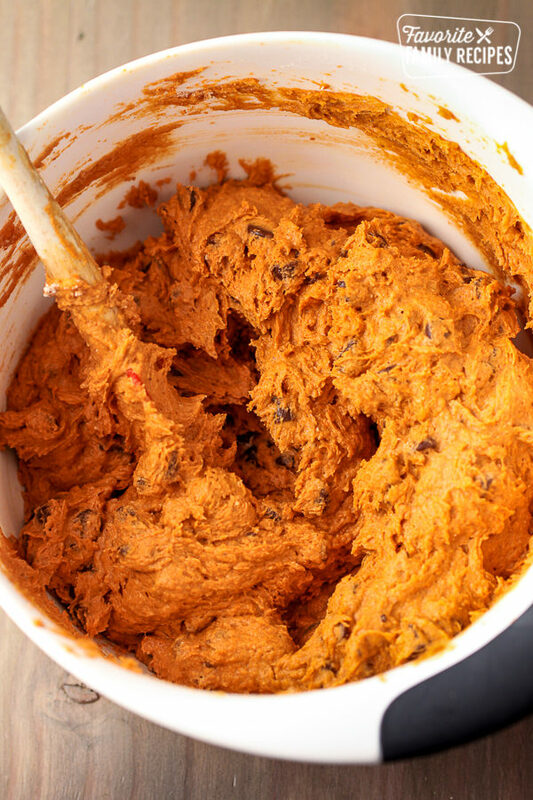 Mix together dry spice cake mix and pumpkin until completely blended. You can also make these as muffins! They’re delicious! (And the pumpkin goes well with other cake mixes too!) I think they’re even part of the Weight Watches recipes. I made muffins like that but I added an egg so they wouldn’t be so dense. Works great! I can see how you’d b hesitant but these look pretty tasty. I might just give this a whirl. I’ve been craving pumpkin. I made these yesterday. I used 1/2 the batter for cookies and 1/2 for cupcakes. They were Yummy! 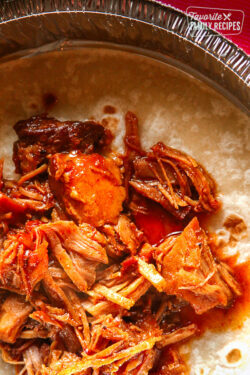 I got this recipe from a friend last year and promptly made them SEVERAL times. I love them and my kids do too. We’ve already made them once this Fall and I’m sure will make them at least a couple more times … You can’t go wrong. 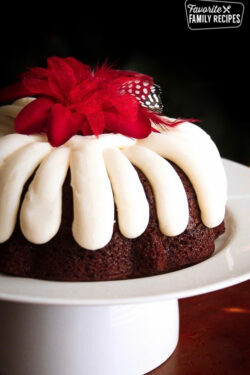 Do you prepare the spice cake mix? Or just mix the powder & the pure? It is just the dry cake mix- unprepared. Just made them, pretty darn good!! Thanks for putting the recipe online! Um Amazing! I just pointed my Mom to this website/recipe. I made a batch on Sunday and by Wednesday my husband and I and almost completely finished them off. He asked me why I hadn’t made more. 🙂 I’ll be adding this to my list of favorites too! Thanks so much for sharing!!! These are so good, thank you!! I’ve made these as mini muffins w/o the choco chips: yellow cake mix/pumpkin, spice cake mix/pumpkin. They are soooo good the next few days. Quick grab-n-go breakfast or snack. Once I added a couple of packages of instant oatmeal (maple/brown sugar flavored). Gave it a little more texture and flavor. Now I will have to try w/ the chips! Woohoo!! How long do you bake the mini muffins,and at what temperature? In the oven now! Do they flatten out like regular chocolate chip cookies? Just made these. How freakin easy was this!!! Have to stock up on the pumpkin before it is gone for the season! I did not care for these cookies. I think I expected something a little crispier. They were easy to make but not something I will make again. I don’t see why not. They are pretty soft cookies though and I don’t know how walnuts would taste in them. We always add chocolate chips, walnuts and craisins to ours and they taste amazing!! I made these for Thanksgiving… They were a hit!!! 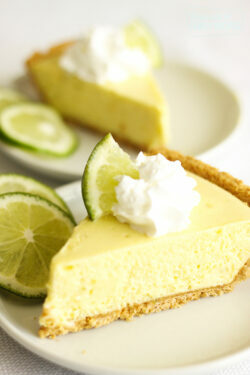 I love how quick and easy they are to make with just 3 ingredients. I definitely plan to make them again… Maybe try a different cake mix. Got this recipie for the muffins at a health fair two years ago. You can use either spice or devils food chocolate cake mix with the pumpkin puree and 2/3 cup water. Great as muffins or as a 15×10 sheet cake with powdered sugar instead of frosting. So easy, healthy, and the first muffin or dessert to run out. The chocolate is delish also! So happy that you liked them! Thank you for the nice comment! They are so easy to make! The texture is interesting.. soft and light, a mix between a cookie and a muffin. I used my scooper instead of a spoon and they came out good! So glad you liked this recipe! It is certainly a favorite of mine this time of year. Using a scooper is a fabulous idea and less messy. I have one from Pampered Chef that I’ve used for years. It works great for drop cookies. Thank you for visiting our site! I like raisins with pumpkin better than chocolate chips, can i switch without changing the cookies ending texture? You could probably just switch it out straight across and be totally fine! Let us know how it turns out! I made these today and love them. i did change it up a bit. chocolate cake mix instead of spice mix and i also added 1/4 cup sugar for more sweetness. Thanks for the ideas! We love creative cooks! 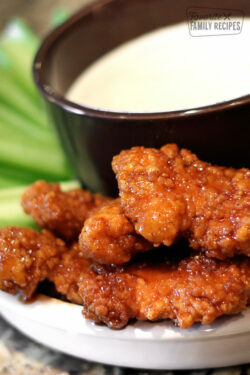 These are terrific and so easy to make! I made these in the muffin style and I think they are wonderful and somehow I just dont feel as guilty knowing all that pumpkin is in there. >=) Thanks for sharing this great idea ladies! On a side note if I were to make the cookies i might dress them up with some cream cheese icing that would be great! Thank you! And great idea with the icing! YUM! Very good!!! Are they supposed to be super soft? Yes, they are way soft and chewy! One recipe makes approximately 2 dozen cookies. They are delicious! Thanks for asking! I calculated and in case anyone wants to know, this recipe yields about 2 dozen cookies at ~155 calories a piece. * That’s pretty darn good for how thick and hearty they are! I had some cooked mashed pumpkin in the fridge and a yellow cake mix that had been in my cupboard for a while so I decided to try this recipe. this is how I tweaked this recipe. 1yellow cake mix, 1Tbl. Pumpkin pie spice, 1lb2oz mashed cook pumpkin (the recipe calls for 15oz but I didn’t want to put any back in fridge or throw it away so I just used it all), 6oz raisins was plenty and 1/4 cup skim milk as the dough seemed too dry for muffins. Preheat oven at 350. spray muffin tin. Fill 12 muffin tins to the top. Bake for about 20 mins or until toothpick comes out clean. TADA!! They turned out great! The bake time was way off on this recipe. 9 minutes the cookies were raw at 16 minutes they still were not cooked. Different altitudes can alter the baking time GREATLY. What altitude are you at? My dad who is a diabetic loves these cookies. They don’t kill his sugar and one after dinner is perfect. I have done both semi-sweet chocolate chips and milk chocolate chips. Both were delicious, my dad prefers the milk I prefer the semi. Depends on what’s in the pantry drawer! These are delicious, easy and my 12 year old who doesn’t seem to like anything he used to like, loves these in his lunches! They are a dense cookie, but ohh so good! Thanks! Pretty easy recipe, although the amount of chocolate chips is wayyyy too much. Would recommend only half a bag. Hi Donna! Thanks so much for your comment and for sharing how you had success freezing these cookies! We haven’t frozen them before but it’s good to know they freeze well! Thanks for the 5-stars!